Amid signs of reform, Burma’s media appears to be being allowed greater freedom. But there are still limits, says one journalist at the center of changes. These conditions had a paralyzing effect. “People were very fearful, fearful to talk about politics and even their suffering,” says Maung Wun Tha, a Burmese journalist of nearly four decades. “They were thinking they were being watched. They saw many people were arrested and sent to jail.” Little more than a year ago, some 2,000 prisoners of conscience were behind bars in Burma’s squalid prisons, many having endured lengthy torture sessions in the time between their arrest and sentencing at a closed-door military court. Wun Tha himself was jailed on three occasions. Greater tolerance for free speech is among the most tangible signs of the Southeast Asian country’s dramatic reform. Since a power handover last year from a military dictatorship to a quasi-civilian government, Burma’s new regime has surprised people in and outside the country by giving substance to the structural change: hundreds of political prisoners were released; diplomatic overtures were made to the United Nations and influential member states; and controls on political association, civil society and the press were relaxed. And, perhaps of greatest symbolic significance of all, the new president reached out to pro-democracy icon Aung San Suu Kyi, who previous regimes harassed, denigrated and kept under house arrest for most of the past two decades. After being banned from participating in electoral politics for over two decades, Suu Kyi’s National League for Democracy (NLD) party fielded candidates in parliamentary by-elections on April 1. The campaign period drew hordes of people to the streets to exercise their newfound right to show support for politicians outside the military clique, and capped off a steady stretch of liberalization that made confidence in the reform no longer seem misplaced. The NLD’s winning 43 of 45 seats confirmed the government’s pledge to recognize the election results. But Maung Wun Tha had cast his bet on better times a full year-and-and-half ago, when many observers believed the transition to civilian rule was largely a ploy for the junta to repair its pariah status – and, specifically, end Western sanctions – while still ruling through plainclothes proxies. At the end of 2010, he launched The People’s Age, a political journal that aggressively pushed the boundaries of what authorities would tolerate. 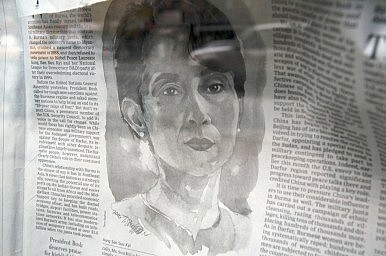 Burma Rethinks Censorship. A Bit. Under the guise of a new parliamentary system, Burma’s government is indicating that it may relax its draconian media censorship policy.